Published June 2, 2012 By Anna T. This post may contain affiliate links. Regardless, I only recommend sites I've researched and/or used and trust. 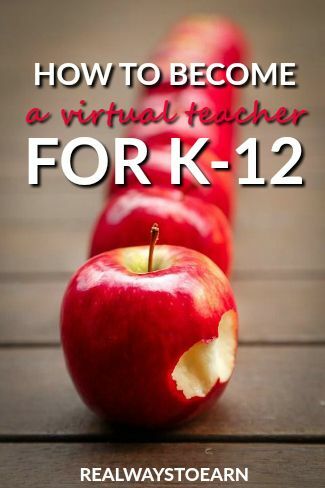 K12 is a company that I often see has openings for virtual teachers. Please note that this is a very different sort of position than most of the online tutoring opportunities I post about. You do have to be an actual teacher with a degree. Also, these jobs are location-based and while you work virtually, attending in-person meetings is mandatory. K12 courses help pretty much all students, including the homeschooled, homebound, military families, kids in summer school, etc. How much does K12 pay? Their website does not give the rate of pay, but I bet that the amount you would earn would be somewhere close to what most teachers in the state you're working in average. Your past experience teaching may also carry some weight. Do they have any benefits? Yes, their careers page has lots of info on their benefits. They offer health, dental, vision, 401K, short and long term disability, life insurance, and much more. You also get lots of paid time off if you need it. What are the requirements to work for K12? It depends on the position you are applying for, but most of what I am seeing requires that you have three or more years of teaching experience as well as a Bachelor's degree as well as have teaching certification in the state the job is available in. While this is a virtual position, it's very very involved and hands-on. This might be ideal for you if you have the required skills, certifications, etc. and you do need to work at home for whatever reason, but you will need to keep distractions at home to a minimum while you are working because it's a very interactive position. It is very, very similar to actually teaching in a classroom outside the home. You speak to the students and they can hear you and speak back. You use a whiteboard on the computer to do your lessons, etc. If you'd like to apply, you can visit their careers page here to see what states they are hiring in currently. I won't list the current open positions here because I'm guessing that they change all the time. Good luck if you decide to apply, and if you already have experience with this company, please comment below and share it! TXVA in Texas is great. I encourage everyone with TX certification to apply. The pay is equivalent to a 1A – 3A school in Texas. With that said, think of your savings in commute, clothes, etc. We did require a distraction free environment during live instruction and meetings. May not be best choices for a young mom who is looking to keep preschoolers at home. Pay is well below average for FT in class teachers in my state as well AND student to teacher ratio is very high. Teachers may have problems keeping up with students because of the numbers they are expected to monitor. Also teacher applicants should know that they are evaluated based on students’ log in time and progression through program. You will spend a lot of time trying to get students to log in or do assignments – with or without parent support. What is included in the k12 background check? I have a misdemeanor on my record. Just FYI–pay is lower than average for teachers in your state. In my experience it is lower than a beginning teacher’s salary in my area, and I have been employed with them for 8 years. I am a certified teacher. I tried applying for this last year and they weren’t very involved in the hiring process. Stinks because I love teaching and would be heavily involved! Please be a good teacher!!! We used k12 last year and my son and friends children’s almost all had horrible teachers! They never answered emails and rarely were supportive. Not an experience we want to repeat.